Class fee is due upon registration, or a check must be received within 5 days of registering. Class fee is only refundable if you cancel 48 hours or more ahead of the first class. This gives me time to fill your spot. Missed Classes: Must be made up within 1 month of the last class of the session. Cancelled classes (due to weather or instructor illness) must be made up on the day class is rescheduled by the instructor. Class size is limited to 7 students. Once the classes are filled, your name will be first on the waiting list for the next session, or another class session may be opened by the instructor. Students will park and meet 15 minutes before class at the Rock Creek Pool and Tennis courts on the Southeast corner of Rock Creek Parkway and Indiana Street. From there, you can walk 5 minutes to my house, or drive over together in my car or one other car. I drive a red explorer. The instructor will meet you at the pool the first day of class to introduce everyone and take you to the house. If you are allergic to cats, don't sign up for a class or take precautions. If you have heath issues with your vision or hands, please call and talk with the instructor before signing up for class. 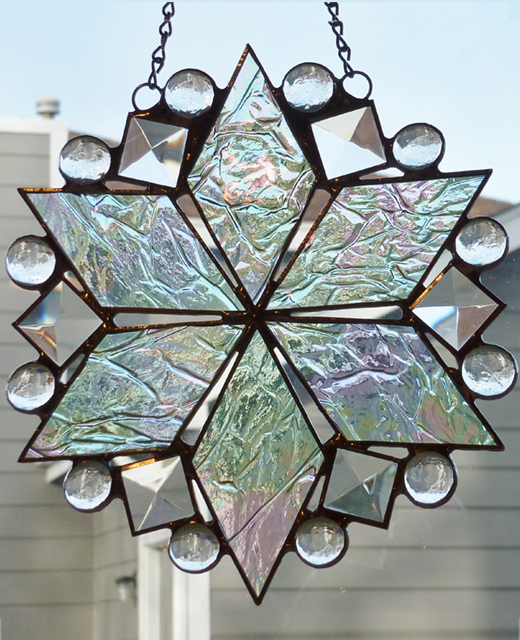 Foil (wrap a sticky silvered tape around all glass pieces), solder and assemble a snowflake using precut glass, bevels, jewels, and globs. Beginners choose from over a dozen patterns. Stained glass experienced students choose from over 18 patterns. Tool rental and materials included. These make great holiday gifts! Learn how to make one, and make many more at home by yourself. 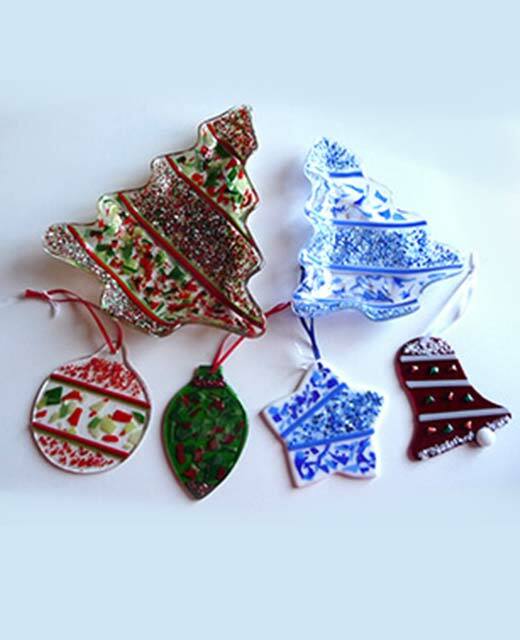 Cut and assemble up to 4 glass ornaments (3x3” bell, star, teardrop, and globe) that the instructor will fire in the kiln, drill a hole to hang it, and add a ribbon to hang it from. Expect to spend $20-$32 ($5-8/ornament plus the cost of optional dichroic glass) on fusing supplies. One small 2” round clear ornament is free. AND/OR Decorate 2 tree shaped dishes. The instructor cuts undecorated tree shapes out of clear or white fusing glass for you ahead of class. Large is 7.75x9” (cost is $16 for a clear base or $17.50 for white), or small is 6x7” ($13 clear/$14.50 white). Let the teacher know at least 48 hours ahead which sizes and colors you would like to make. You decorate them with frit, stringers, noodles, paint, nuggets, dichroic scrap glass, and confetti glass, which are all included in the price. Dichroic firesticks, non-scrap dichroic glass, and precut glass shapes are extra. The instructor then fires them in a glass kiln. No fusing or glass experience required. Tool rental included. Note: There is enough class time to make 4 ornaments, or 1 tree dish + 2 ornaments, or 2 tree dishes. Ornaments take 2 days for the instructor to fire/drill holes, and tree dishes may take up to a week to fire. 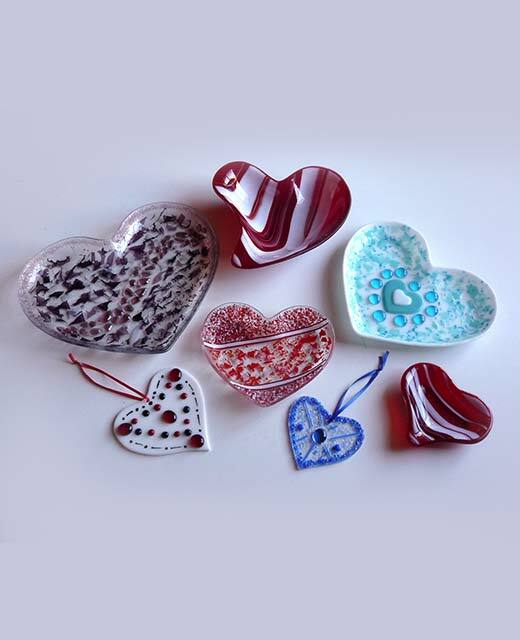 Learn mosaic skills by painting your pot, cutting glass into squares/triangles, and gluing them to a pattern on your pot. Start gluing your pieces on in class and finish at home. Come in on your own time for 1 hour to grout your pot. The pot, glue, and grout are include in the class fee. Expect to spend $22 on mosaic cutters and around $10 on glass. Make an 8x8" square stone using a precut glass kit and a quick drying cement called DiamondCrete (DC). Pick out your glass kit and color of DC at least 3 weeks ahead of class to guarantee your choice. Expect to spend ~$38 on the mold, DC, and glass kit. You keep the mold to make more at home. No experience required. 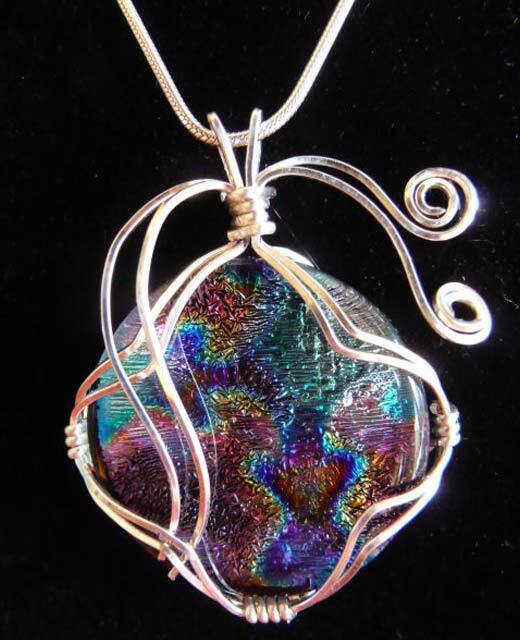 Learn how to wrap a glass cabachon in soft sterling silver wire to create a beautiful pendant. Materials (glass cabochon & silver wire) included in the class fee. You will need to bring or purchase the following tools: flat nose plier, round nose plier, thin needle nose plier, diagonal flush wire cutter, hemostat, dental pick, 3.22mm (or 3.25mm) crochet hook. You can purchase all the tools through Great Glass Galore for around $53. (Note: Tool prices may change.) Please request tools at least 8 days ahead of class.